Set in modern day London, the story takes place in a world where "Shadows" are born from human fear and anxiety. A young girl arrives to study abroad, only to be caught in a bizarre incident as she enters university. In a city with no acquaintances, the helpless girl wanders into "Café Forbidden," a mysterious café that exclusively opens at midnight. She meets an assortment of handsome men employed at the café, where guardians who protect the boundary between humans and shadow convene. This review was written after seeing all episodes. At first glance, “Phantom in the Twilight” appears to be a reverse harem in the style of many otome-based anime from the past so many years, but it doesn’t quite fit the bill. The series itself doesn’t seem to know what it’s supposed to be and throughout its short twelve-episode life suffers multiple times from an identity crisis. One episode it seems to be following in the footsteps of otome-based series, the next it’s turned to head down the path of one-episode arcs with an overarching theme to tie the episodes together, and yet another episode it begins to crawl towards a focus in action. If you’re looking for a series requiring deep thought, or even active thinking, this series will bore you. If you’re looking for a series to pass the time and chill, something not requiring much thought or attention to understand, then this series might serve you well. With that out of the way, let’s get into why it received an overall rating of 6. The story itself is nothing special. Two college-aged girls, Ton and Shinyao, traveled to England to attend school. Ton has always wanted to go to London due to her great-grandmother having left her family to go there. Due to a mysterious incident that happens early in the first episode the two girls become separated, and due to a searching spell which Ton inexplicably knows (you’re supposed to assume she learned it from whatever sources she used to learn of her great-grandmother apparently), she finds herself in a café with individuals whom of course are not human and are male; however, she need not worry, for they have a connection with Ton’s great-grandmother and are plenty eager to assist her. At this point it’s normal to assume that this is a set-up for a bunch of shipping scenes between Ton and all the males, but I’ll give the show credit, it didn’t take the easy route for the relationships (though it would be the logical choice for a show such as this). From the second episode onward the show travels in different directions and doesn’t do an amazing job in any area of the story. The surprises aren’t big, and even when not entirely predictable, simply leave you thinking “okay, no biggie”. After each episode (minus the final) there are little chibi shorts which provide a little insight into the “world” of the show which are a cute addition and are actually be my favorite part of each episode, which isn't exactly a good thing. Art: Not going to bother going into any details or rating, nothing special, onward to the next thing. The voices suited the characters very well, none felt out of place, which is always nice. The opening theme I personally didn’t care for and tried to add to the action vibe of the show I felt. The ending theme more often than not broke character with the final moments of each episode but was pleasant to listen to. Battle music was nothing extraordinary but served its purpose. Characters are flat, two dimensional, and aside from one of the side characters have no development; even with the side character, the development was foreseeable and nothing special. All the characters, even the villains, fall into neat stereotypes. While decent character growth would be hard to achieve in a short series such as this to begin with, there’s no effort whatsoever to be creative in the character department. I began watching the show just to watch it if that makes sense. I didn’t have high expectations, so by the end, I wasn’t disappointed… Okay, I was slightly disappointed; the action scenes truly are lame considering how many of them are thrown in. As I mentioned in the beginning, this show works well if you want to watch something casually, but if you’re looking to become engrossed in a series this isn’t the series you’re looking for. As previously mentioned, this series lacks a true identity. It doesn’t have enough romance or shipping material to make fans of otome-based series satisfied. The action scenes are not worthy of considering this a true action series. The drama is not dramatic, the surprises are not that surprising, but at least the ending is somewhat of an ending. That’s right, the ending does at least provide enough closure where things are settled enough, you’re not left expecting anything beyond this final episode; a mediocre predictable ending granted, but for a mediocre predictable series, this ending works just fine. Please note this review is intended to be read by those that have finished watching Phantom In the Twilight and while care has been taken to minimize story related spoilers there may still be spoilers within character analysis. You have been warned. Based off an original piece of work Phantom in the Twilight is a fantasy and action anime that gives us the opportunity to see what will happen if a pair of transfer students that are freshly arrived from their homeland in the bursting metropolis that is London find that far from being just a city of tiny café’s and rich medieval history the city also plays host to a shadowy world that its population is largely unknown off. A world that not only plays host to a large number of shadowy creatures called Umbra but also serving as the stage in which they would act to protect their rights by fighting against sketchy paramilitary organizations that are determined to stamp them out. This idea of a transfer student becoming involved in a shadow war as she tries to get used to not just the new locale but also of the remarkable lineage and abilities that her beloved grandmother had hidden from her I felt was an interesting one and added in a sense of mystery and discovery to the series action and fantasy-based story. While I been to London plenty of times and I can clearly see the medieval elements that contrast well with the more modern aspects that have grown up around it I always had that thought that what if beneath this modern aspect of the city was another world that houses creatures that society would consider not just unnerving but also scary as well and that they lived in a society that mirrored ours. While Phantom in the Twilight made use of similar themes it instead made use of the parallel world concept in a different way by using the hidden in plain sight view but despite this, I still liked the idea that it chose as its main premise. Taking place in modern day London the overall story of Phantom in the Twilight follows the adventures of Baileu Ton a transfer student from China who had arrived in London with her fellow transfer student and friend Shinyao in order to attend a university there. However, while transferring to attend a foreign university is one of her main goals beneath this is a more personal matter in that Bai has been searching for the reason as why her grandmother that she had respected a great deal had made such frequent trips to the city and to what purpose. After a bizarre incident leads her to a mysterious café that only opens at night and its equally charming and cryptic staff members Bai is faced with a surprising revelation that revealed that Bai’s beloved grandmother Sha Rijan was far from being a normal woman but was instead one of the handful of guardians that protected the hidden world that parallels her own. A world that is not populated by humans but by shadowy creatures called Umbra who can take forms ranging from vampires to werewolves and a world that only a few trusted people know off and whose reveal will cause nothing but shock to the people of society. As Bai gets to know the members of the café’s staff she realizes that each and every one of them have the utmost respect for her grandmother and each member while having differing personalities and sometimes antagonist relationships with each other all share a common goal in that all desire to create a world where umbra and humans can coexist with each other peacefully. After realizing not just how much her grandmother had fought to create such a team but also how much she and her team aspired to make such a dream a reality Bai decides to join the team after realizing that while there are many umbra that can be malicious there are also many that would help their fellow humans in their time of need despite being a different species. But their path will not be an easy one as despite the common people not knowing of the world’s existence the shadowy organization Midnight Sun and the mysterious and enigmatic controller that acts from the shadows have their own nefarious plans for the world and the only thing standing in their way is the guardians of the umbra world the Twilights. Joining Bai in her quest to protect the hidden world are a host of characters that include the arrogant but honest Vlad, the laid back but surprisingly perceptive Luke, the carefree but energetic ghost Wayne and the quiet but surprisingly polite Toryu. Together this team would stand and fight hard to protect the world of Umbra’s from all manner of threats whether it’s a paramilitary organization or an evil controller who loves to expand his life by absorbing the power of the umbra. No matter who it is Bai and her team would stand and fight for their beliefs determined to maintain the peace between the two worlds. Baileu Ton voiced by veteran seiyuu singer Kana Hanazawa of Mahouka Koukou no Rettousei and 3 Gatsu no Lion fame is one of the main characters of the series and is the main heroine of the series. A teenage girl that recently arrived in the city of London as a transfer student for one of the cities universities Baileu Ton who prefers to be called by the name Bai in the beginning of the series was a positive, cheerful and determined young woman that firmly believed only in what she can see and understand and was not someone that believed in sketchy things like umbra’s that easily. While positive and determined Bai was also an assertive person that resonated well with her independent and curious nature that often ended up dragging she and her friends to different areas. However, while an assertive person Bai was also someone that was kind, caring and honest and can be surprisingly responsible at times. This aspect of her personality is helped greatly by the fact that Bai is someone that’s both perceptive and understanding and is someone that prefers to act with her heart and the feelings that she has towards something rather than the cold logic that others would expect. An example of this is when Bai tries to understand the underlying issues that are the cause of Luke and Chris’s strained relationship and her attempts to solve them. At the beginning of the series, Bai as a result of her beliefs did not really believe that something as outlandish as umbra existed and as a result, she viewed the team with some degree of exasperation believing that her grandmother may have encountered a band of tricksters. But after not just seeing the fact that Umbra is very much real and after awakening powers of her own this sense of disbelief gradually begins to fade and after realizing both the jobs that the team does and the dreams that her grandmother had inspired within them this is replaced by a desire to help them achieve their dream of creating a world where everyone can live in harmony with each other. As the series goes on and as Bai see’s not just how diverse the many species of umbra can be but also see the many strong bonds that can form between umbra as they live in the world Bai’s personality gradually changes as she realizes that while different to humans on account of their appearance and abilities the umbra are not naturally evil and that many umbra are just trying to live about their lives like normal people. At first Bai was shown to be slightly hesitant about not just the power that she had awakened but also about the powers that each umbra possessed but as time passed and she got to bear witness to the attempts by the team to use their powers to help others this hesitation began to disappear and instead is replaced by a desire to not just embrace her own powers but learn to use them and help others just as her grandmother did when she led the team. As Bai gradually learned to not just control her powers but also expand on them as well her attitude towards the rest of the team gradually softens as she learns to let go of her preconceptions and learn about each member of the team and in the process forming strong bonds of friendship with them and learning to trust them much like how her grandmother did in the past. At the beginning of the series, it is noted that Bai due to her independent and curious nature is someone that has a tendency of acting without thinking and making rash decisions without considering the wider strategic picture of an encounter. While still present to a degree within Bai after her awakening this sense of misguided bravery is instead complimented by the fact that Bai in addition to having much more control over her powers has also discovered the value of both caution and creativity and easily able to use this to deal with situations in some surprisingly creative ways. Vlad voiced by veteran voice actor Takahiro Sakurai of Log Horizon and Food Wars fame is one of the main characters of the series and is one of Bai’s allies and teammates within the series. A vampire umbra who takes the form of a young man in his twenties Vlad in the beginning of the series was seen to be a serious, patient and hardworking person that while clearly skilled at his job as the café’s coffee maker was also shown to have a certain level of arrogance about him that many would find out of place for someone of his role. While a quiet person by nature and one that prefers to keep his own counsel, Vlad is also shown to be a capable leader and acts as the overall field commander of the team until Bai arrived. In this capacity, it can be seen that Vlad is someone that true to his lineage of being a descendant of one of the most famous vampires is someone that’s cautious, intelligent, perceptive and level-headed and approaches each situation carefully always thinking of the larger picture and the status of his team. In this state, it can be seen be seen that while Vlad has great pride not just of his skill at making coffee but also in his abilities as a leader that Vlad does actively care about his teammates and rather than just worry about the present also cares about their futures as well. This latter part is seen in the ever-evolving relationship that he establishes with Baileu Ton the descendant of his first master Sha Rijan. In the beginning of the series it can be seen that while Vlad respects the fact that Bai is both Sha Rijan’s descendent and that she wants to use her newly awakened powers to help their fight against the threats to the umbra world that he is extremely reluctant to allow her as he feels that putting her in danger would not just her life at risk but also potentially cause her demise as well. Indeed, at the start of the series, it can be seen that both Vlad and Bai argued constantly with each other with Bai both surprising him with the growth of her powers and dismay at some of her actions. But as the series goes on and Bai’s powers increase Vlad realizes that Bai’s stubbornness is exactly like that of her grandmother and instead resolves to protect her and watch over her just as he did in the past. I felt that his voice actor Takahiro Sakurai did an excellent job of portraying the character of Vlad. Luke Bowen voiced by veteran voice actor Nobuhiko Okamoto of Blue Exorcist and A Certain Magical Index fame is one of the main characters of the series and is a fellow team member of Bai within the Twilights. A werewolf umbra that takes the form of a man in his twenties Luke at the beginning of the series was shown to be a bit of a free spirit in that he’s laid back, cheerful and loves playing jokes on people. As a result of this, it can be seen that Luke and Vlad often argue with each other mostly a result of Luke messing with Vlad's gear. However, despite this apparent antagonism between the two, it can be seen that Luke is someone that cares about his friends and values them immensely and that his arguments with Vlad were simply part of his joking nature. Despite his joking and laid-back nature Luke is someone that’s shown to be both intelligent and fast thinking and able to deduce easily when things are awry which is helped greatly by the unique abilities that werewolves possessed specifically their enhanced hearing and sense of smell and in this its perhaps unsurprising that Luke is often employed as the scout of the team. As a result of his friendly and cheerful nature Luke was one of the first members to befriend Bai and bond with her in her early days when she was still trying to get to grips with the new reality that was in front of her and helped greatly in easing much of her concerns by providing some surprisingly deep advice. Unlike the likes of Vlad who had not encountered much in terms of prosecution by humans, it can be seen that Luke while maintaining his cheerful demeanor is someone that had experienced the darkness that lies within society and in his case cost him the strong bonds that he had with his brother Chris. However, unlike his brother Luke still held the belief that a world where both umbra and humans can live together in harmony can become reality and tries hard to both locate his brother and convince him that his rage against humans is misguided. Wayne voiced by veteran voice actor Daiki Yamashita of Re Creators fame is one of the main characters of the series and is one of Bai’s fellow teammates within the team. A ghost type umbra that takes the form of a young human boy Wayne on the surface is a carefree, positive and energetic person that behaves similarly to a kid. Being a ghost and inhabiting a body that’s unsuitable for being used in combat Wayne knows that his role on the team is rather limited but rather than causing him to feel sad about it this instead awakens within him a desire to be useful to the team by feeding them accurate and real-time intel that can be acted upon by the team. This shows that despite lacking the combat focused abilities of Vlad and Toryu and being an entirely different type of umbra to them that Wayne is determined to be useful to them showing not just his loyalty to his friends but to the dream as well. Despite having no combat potential at all Wayne’s ability to enter inanimate objects and look inside them for data I felt was an interesting concept and showed that battles do not necessarily have to rely on brute force to win and that timely intel can also be decisive in securing victory. Toryu voiced by veteran voice actor Tomokazu Sugita of Kanon and Food Wars fame is one of the main characters of the series and is one of Bai’s fellow teammates within the team. A Jianshi umbra that takes the form of a human that’s in his late twenties Toryu at the beginning of the series can be seen to be a quiet, kind and polite person that approaches each of his tasks with calmness and in a composed manner. Unlike the likes of Luke and Wayne, in the beginning, Toryu was a bit of a loner and preferred to do things on his own rather than involve others. Despite his quiet nature, however, Toryu was someone that was willing to offer his advice to others quite readily, but his advice tends to be on the descriptive side. From the beginning of the series, it can be seen that Toryu was very loyal to not just the dream that the team and Sha Rijan aspired to achieve but also to Sha Rijan herself as too him she was someone that had saved him from a life that would have ended in death. As a result of this at the beginning unlike the other team members, Toryu had a very high opinion of Bai and hoped that she would be a worthy successor to her. As the series goes on and more of Toryu’s personality is revealed it can be seen that beneath his quiet and efficient surface personality Toryu actually has many struggles that he battles with unknown to the others. As a result of how Toryu came into existence Toryu often saw himself as nothing more than a tool and one that’s only to be used to help others achieve their aims and not share in their victory and thus creating the loner like existence that he presents to the team. As a result of this Toryu, in the beginning, saw himself as expendable and was willing to take heavy risks in order to secure victory to the dismay of the rest of the team. However, after Bai and the team saved him from a precarious situation this changed as Toryu was able to realize that a human heart is not something that only humans can have and that by developing feelings and emotions and forming bonds with others a heart can also be formed as a heart can also be something that serves as a source of motivation for the bearer. As a result of this change, Toryu becomes not just more assertive but also more talkative and willing to contribute to the team more by providing his own opinions and assessments on their actions. Chris voiced by veteran voice actor Yuki Ono of Granblue Fantasy and Food wars fame is one of the main support characters of the series. A werewolf umbra that takes the form of a human male that’s in his twenties Chris’s most notable trait is without a doubt his white outfit and the fact that he never takes off his sunglasses. A quiet and calm person by nature Chris can be someone that’s considered to be the very image of an ideal loner in that unlike his brother Chris is someone that prefers to act alone and shuns the act of friendship and bonds that most people would aspire to form. However, while fiercely independent and having a visible dislike of humans Chris isn’t the type of umbra that will kill indiscriminately and is instead someone that is kind, considerate and confident and has a surprisingly strong sense of honor that forbids him from killing innocents that he stays loyal to which is shown in how he treated Shinyao relatively well and kept her safe. At the beginning of the series, it can be seen that Chris was someone that viewed humans with not just dislike but also outright hatred due to events that happened in the past. However, as the series goes on and Chris not just encounters but also befriends humans this attitude of his gradually starts to thaw as Chris starts to realize that like the umbra there are many types of humans and that not all are the manipulative and cunning types that caused him so much pain in the past. key to this development of Chris’s personality is the importance that he places on the value of promises and a willingness for someone to stand by them which is shown in how impressed he was in seeing Shinyao remember the one that was agreed upon between them a fact that helped greatly in convincing him that not all humans are bad ones and that some are indeed kind and caring and willing to aid them if called upon. This is seen in his gradual bonding with Shinyao and the continued protection that he provides to her despite the fact that he could have got her to safety. In terms of animation, I felt that the character designs for the series were pretty good with the contrast between the main casts umbra selves and their human selves being especially so. The combat outfits that are worn by the team when doing their night job, I felt was pretty well designed as it highlighted the specific species that the team member belonged too in a way so that people would be able to tell what species they were from. Examples of this include the long cape of Vlad the vampire, the loose fitting but easily destructible shirts worn by Luke and the ancient Chinese style outfit that’s worn by Toryu. In terms of locations and settings, I felt the series did a great job of showcasing the setting of London and the various locations the cast visit over the course of the series. Each location while based off a real-world location and was largely faithful to them I felt also made great use of them as settings for the various fights that the cast takes part in. Notable examples of this include Hyde Park and the Tower of London. Combat animations wise I felt the series did a pretty good job at showing the kind of strengths and unique talents that each umbra species has which within the series translates into some pretty well-designed fights that were both interesting and unpredictable with notable examples being Vlad’s rescue of Bai from the department store and the teams fight against Van Helsing. In terms of music, I felt that the series OST was a strong one that helped greatly in providing some excellent situational music to the various types of scenarios that Bai and the Twilights encounter over the course of the series. In terms of opening’s the series makes use of one opening and ending theme which was Flowery Song by Jiro Wang and Home by May’n respectively. The former I felt created a sense of tension and anticipation in the air thanks to its rock type genre and had the effect of welcoming you to another episode where you get to see Bai and the Twilights continue their fight against their opponents while the latter had the opposite effect being one that reminds you of peace, calm and a time to heal and reflect. These two songs I felt for these reasons contrasted well with each other especially in light of the heavy struggles that the team goes through within the series. In terms of voice acting, I felt that the voice cast of the series did an excellent job at portraying their assigned characters whether these were main ones or supporting ones. In particular, I felt that Kana Hanazawa, Takahiro Sakurai, Nobuhiko Okamoto, Daiki Yamashita, Tomokazu Sugita, Yuki Ono all did an excellent job in portraying the characters of Baileu Ton, Vlad, Luke, Wayne, Toryu and Chris respectively. Additionally, while I didn’t cover their characters within the review I felt that the Junichi Suwabe and Manaka Iwami also did a great job at portraying the characters of Hayshin and Shinyao respectively. Overall Phantom in the Twilight was an anime I really enjoyed with its main strong points being its interesting premise, strong story, well designed characters, strong voice acting and an interesting take on what can actually be hidden behind the busy metropolis of London a city that while modern on the outside has a long and dark history that provides more than enough negative energy for Umbra to materialize and cause havoc on its unsuspecting populace. The overall premise of the series which was a transfer student’s encounter with a mysterious café that’s staffed by people that seem to know her dear grandmother well and the revelation that her grandmother despite Bai’s good relationship with her was hiding the fact that she was not just a powerful ability user but also an important guardian and team leader that helps protect the hidden world of the umbra I felt was a strong one that was bolstered by the fact that the very waiters that work in the café were not just her grandmothers former team but also of the fact that they were not human. While the premise I felt was good this wouldn’t itself be enough if the premise isn’t married to a good enough story that takes advantage of not just the rich lore that comes from the world of the umbra but also of the unique struggles that exist within the world unknown to the general population. The overall story of the series I felt was relatively interesting as while doing a great job of introducing Bai and us to the hidden world of the umbra the story also did a great job of showing the kind of struggles that both the team and the many individual umbra struggle to deal with while living out their lives. This contrast of seeing the important role that the members of the team play in their attempts to maintain peace within the umbra world by dealing with troublesome umbra whose actions if left unchecked would cause not just heavy damage to the world but also reveal it and the personal struggles that they and the umbra have to struggle with I felt was a good one that showed just how divided the world can be. This insight into both the professional duties of the team and into the many personal issues that each team member and their fellow umbra have to wrestle with I felt was interesting as while each team member was very efficient at their role of hunting down and dealing with troublesome umbra was not just mentally fragile but also struggling to deal with the many insecurities and doubts that plagued them while trying to hide it from their companions. These insecurities within the series I felt matched well with the unique personalities that each team member possessed and when used in conjunction with Bai’s development as not just a character but also a team leader and valued member of the team served to not just allow the team and Bai to overcome these insecurities that were holding them back but at the same time allow them to further improve their skills and teamwork as they continue their fight. This gradual bonding between Bai and the team as they both sought to not just overcome their doubts but also try to improve not just their teamwork but also themselves as they try to protect the rights of the umbra and those that are dear to them from the likes of the midnight sun I felt was well done as it showed their determination to create a world where both umbra and humans treated each other with respect and one where both races could coexist peacefully. While the bonding between Bai and the team and their gradual evolution into an effective team as they overcome both personal and professional issues form a large part of the series overall story it can be said that without an effective opponent the team’s development would have been for nothing. In this, I feel that the main hostile organization that the team faces in the course of the series which was appropriately called midnight sun was a bit of a mixed bag. While the ideology of the Midnight Sun was something that was understandable, and their motivations clear I felt that their first main villain Van Helsing was a relatively poor one as while his motivations were clear his actions were rather too straightforward, and his actions were too predictable. In contrast to him, I felt that his replacement Hayshin was far more capable as his plans were not just creative but relied on both cunning and his insight into the umbra to make them far more successful than his predecessors plans ever did. One of the central themes within the series is the interaction between humans and umbra and the forming of not just respect for each other but also bonds of friendship between them. While this was shown well within the story in the form of Bai’s gradual bonding with the members of Twilight and her gradual determination to fight with them to create a peaceful world I felt that this theme was shown best in the interactions that Shinyao had with Chris during the time they were together. While initially hesitant and scared after being kidnapped by him this attitude of her’s gradually evolved to that of trust and understanding and perhaps something more as both got to understand not just their personalities and beliefs but also of the inner darkness that Chris had within him. This latter point I felt was used well in this regard as its gradual disappearance was a great indication of the fact that Chris’s attitude towards humans was slowly improving as a result of his bonding with Shinyao. 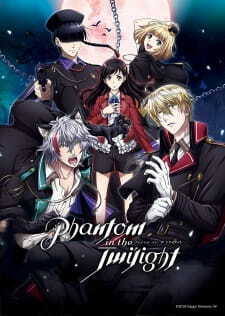 Overall I felt that Phantom in the Twilight was an interesting anime that had a unique premise, interesting story, unusual setting in regard to its location, well designed and developed characters, strong combat scenes, excellent voice acting and some interesting themes that were not just intriguing but also used well within the series. While the first arc of the series was a relatively slow one I felt that the second arc of the series more than made up for it by making use of some creative villains like Hayshin and raising the stakes substantially. As a final score, I would say that Phantom In the Twilight deserves a final score of 7/10. It's easy to dismiss the otome and reverse harem genre troupes that Phantom In The Twilight has, but since it's an original series that's made to promote Chinese game developer Happy Elements's (which brought us Spring 2018's Last Period, which was a fun time) latest smartphone game, the similarities could not be stark contrasted until the series started fleshing out itself, with the final product being a completely different stand-alone media, all on its own. Handled by Fumiaki Maruto (Saekano, Classroom Crisis) and Shunsaku Yano for the overall series composition, Phantom In The Twilight tells us the tale of two friends: Baileu Ton and Mu Shinyao, who has just arrived in London, supposedly for a student exchange program, when suddenly evil forces kidnap Shinyao and leaves Ton in the lurch. In comes 4 men: Vlad the vampire, Luke the Wolf, Toryu the machine-gun frontman, and Wayne the Polygon walk-talk-hacker child-looking kid, with a fierce and cunning true side. These men, who are called the Twilights, work together at Café Forbidden, the mysterious night-only café that serves as a haven for what they call Umbra: living creatures of the shadow world that was once governed by Sha Rijan to keep peace between both humans and Umbra. It is there too that Ton learns that she is the descendent of Sha Rijan, and has to use her powers to maintain the same peace that the fromer has upheld against the Snowmary Corporation, guarded by 2 men: Haysin and Backup. Each responsible for the power development of both Ton and Shinyao respectively, for both to face each other in an inevitable fight. Along with other side characters (Chris, Detective Gregory on the good side; Van Helsing on the bad side), it's an action-packed supernatural fight that honestly is anything but noteworthy, yet it works to give the original game more retrospective (how this adaptation follows the game, I have no idea so don't ask me how). The character designs were intriguing yet appealing. Created by Hidari (Fire Emblem Echoes), all characters were uniquely designed to give them their characteristic traits, and based on how the anime adaptation went all out with, it's easy to see why their course of action resembles the demeanor look they have on their faces and expression to keep moving forward and not letting their enemies breathe space. I specially like how both genders were represented here with the troupes being absent, such as Ton with her tomboy-ish shorts and not being the damsel-in-distress (while Shinyao is the total opposite, but silent with an invisible but strong power), and the Twilight guys who are constantly saving the day (with Luke's brother Chris siding with the Twilights to protect Shinyao at all costs). Speaking of relation-"ships", I naturally ALSO thought that there would be this constant scene of the main guy fawning over the girl MC, even if vaguely shown in the OP sequence. And earlier I've said the otome and reverse harem clichés are red flags, but guess what? This series ADDS another one into the mix (with Chris and Shinyao becoming the hidden couple) as if one isn't enough! And if that ain't gonna break the bank, they throw the clichés out almost immediately! Simply ingenious. For a world that's as large as London would go, I have to say that Liden Flims did a good job relating the world-building and confining to the elements of the show, showcasing the vast lands of London and imitating the actual landmarks to a T. The action scenes felt strong too, but a little overdone, as is with the sacrifice of quality in a 50/50 supernatural-action packed series that just chocks emotions of anticipation and "fine"-ness. And of course, the art is striking and beautiful, just as you would expect from the series itself. The music, probably is the lowest point of the series (to my taste). The OP, aside from its generic genetics, has grown on me a lot. I still don't like it mind you, but it eclipses the setting of the overall going-into-the-story and setting quite nicely. May'n's ED feels very out of place, until you realize that it's the overarching finale of both Ton and Shinyao coming and returning "HOME" to one another as is with their childhood memories, and that's where the ED starts making sense. It's a good song, but the execution was somewhat wrong. Overall, Phantom In The Twilight has nothing special going for it regardless of its "Original" source, but what it does, it executes in what it could succeed at, and that is all that it matters. Think nothing of the general troupes that fills your tastes when you start watching this show, and you will end up fine. For an otome adaptation, this one wasn't half bad. At least I didn't loathe the female lead. A little more romance would have been nice but I prefer the lack thereof to the forced romance in many otome. 1. The female lead was strong in her own right and not whiny and annoying. 2. The male characters were believable and funny. 3. The story was intriguing if shallow. 1. It moved awfully fast. There were times it was confusing because crucial information was left out. 2. There was a lot of kidnapping. 3. The characters weren't as developed as they could have been. 4. The vampire didn't drink blood. Kind of a penultimate aspect of being a vampire, and it wasn't there. This is much different than the typical otome anime in that it's not about "which guy will she choose?" It really is just a group of guys helping her and her friend. That was refreshing but I would have liked a little romance at least. There was a hint that there might possibly be romance in the future, but that was it. There could have been a lot more character development and it would have made the guys exponentially more interesting. I really would have liked to have seen some extended flashbacks of their lives. The hints we were given weren't enough to make me really get attached. One thing that was really difficult for me was that once the main character found out "who she was," she suddenly knew how to do all this very powerful magic with zero training. They also never explained how or why the other female character had magic, what the heck it was, or how she knew how to use it. The story itself wasn't well explained either. Some of the villain motivations were explained but they were so trite. It had the potential to be much more than it was. Overall, this wasn't a bad anime and for an otome, it wasn't bad at all. But it wasn't great.